Home » Greek woman from Marmara island. 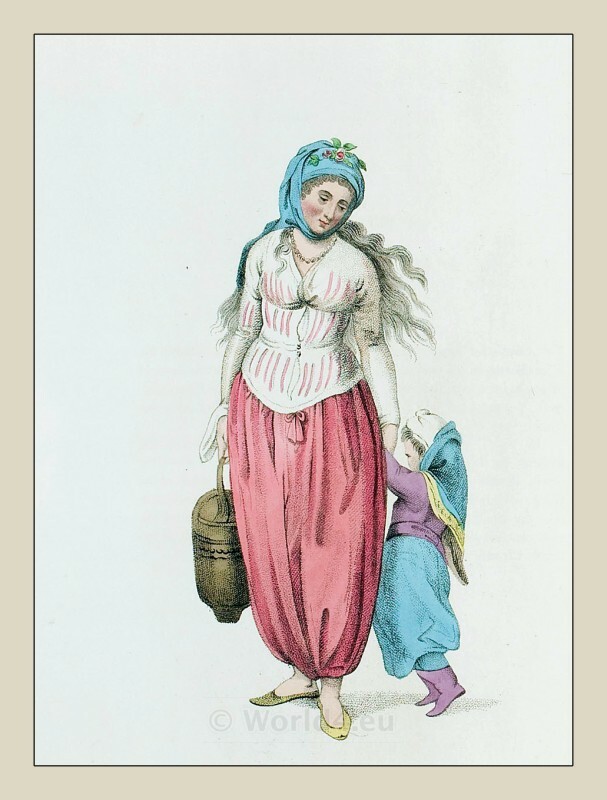 A Greek woman of the Island of Marmara. A Greek woman of the Island of Marmara (with her child). THE dresses of most of the modern female Greeks, who inhabit the different islfor the most part extremely elegant and becoming. And the one given of an inhabitant of the isle of Marmora, with her child by her side, is highly picturesque and striking. The island of Marmora, according to Strabo, was known to the ancients by the name of Proconnesus. The inhabitants are all of the Greek church; though for a short time, a few years ago, those of the village of Klassaki professed Islamism, in order to avoid the capitation tax: but the Turks did not like the experiment; and for fear of the example, they doubled the tax. The consequence was a return to the Greek Church. This entry was posted in 1804, 19th Century, Ancient Greece, Child, Ottoman Empire, Turkey Costumes and tagged Greece national costumes, Octavian Dalvimart, Ottoman Empire costumes, The costume of Turkey on 7/30/13 by world4.